Bigfork Anglers is the only outfitter owned fly fishing shop in the Flathead Valley. 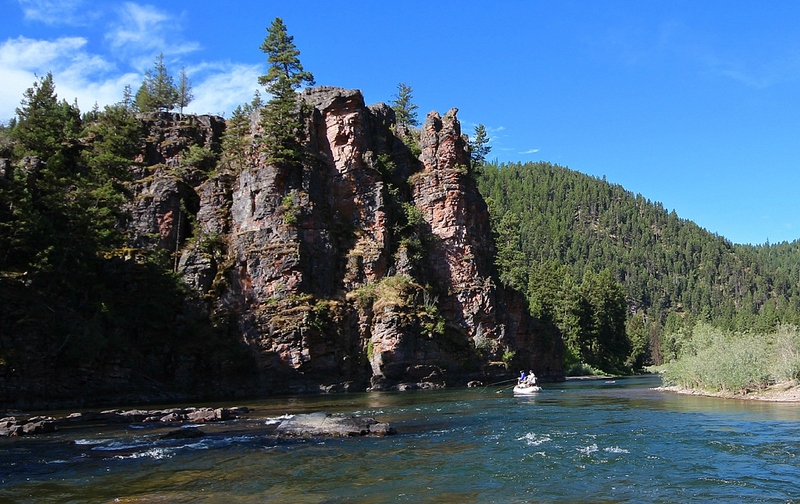 We have been organizing fly fishing trips and guiding folks down Montana rivers for over 19 years. As a result we understand what it takes to provide a high quality experience on the water. In the past 19 years we have established a vast network of accomplished guides, most of which have been guiding 10+ years. Our guides take their job serious and work hard to make sure our customers have a successful trip. They are all accomplished anglers and instructors well versed in instructional fly fishing for anglers of all skill level. We utilize quality drift boats, rafts, and fly fishing equipment to make sure you have an enjoyable day on the water. With our close proximity to Glacier National Park we do a lot of our Bigfork Montana fly fishing float trips on the Flathead River System near Glacier Park. Fly fishing on the Flathead River is great for all skill levels and offers dry fly fishing for native Westslope Cutthroat. Our guides specialize in instructional fly fishing trips and are all patient teachers. We also offer trips on numerous other rivers near by for those who don’t mind a little window time. We do our best to match our guests with the guide and river that will help them enjoy their day on the water. Licenses and gratuities are not included. Equipment: Our guides come prepared with all the fly fishing equipment you’ll need for a successful outing. Transportation: If necessary and circumstances allow, we will provide reasonable transportation free of charge. Some of the areas we fish are remote and shuttle services are not dependable. Having your own vehicle will provide the most flexibility when choosing where to fish. Full day trips include: All necessary flies, terminal tackle, rods and reels, 7-9 hours of fishing, a hearty lunch with non-alcoholic beverages. Half day trips include: All necessary flies, terminal tackle, rods and reels, 3-5 hours of fishing, snacks and non-alcoholic beverages. Bring your own lunch: If you would like to save a few $$ or you are a picky eater, provide your own lunch, we will knock $25 off our full day rate. We will still provide a cooler with ice and water. Our trips are primarily float-fishing based. We use drift boats and rafts with customized fishing frames. If you are interested in a wade fishing trip, give us a call and we can discuss options. *Drift boats and rafts are designed to accommodate two anglers. We recommend only two anglers per boat for maximum comfort and casting room. If circumstances allow, a 3rd angler can be accommodated on some float trips. Three anglers are the maximum capacity per boat on a float trip, but only two anglers can fish at a time. A third person on a float trip will be charged an additional fee of $100 on a full day and $50 on a half day. We request a 50% deposit to be held until the day of the trip. This deposit is refundable in full if the trip is cancelled at least 30 days prior to the date scheduled. We will also refund the deposit in full if the guide can be rebooked for the date scheduled. This is the only way we can protect the guides from losing a day of work if a client doesn’t show up. We understand that unexpected situations can lead to trip cancellations. We reserve the right to evaluate the circumstances and make refund decisions on a case by case basis. If a mutual agreement is made between the shop / guide and client due to weather, state or federal closures, or other unforeseen events, the entire deposit will be refunded but we very rarely cancel a trip due to weather. Cancellation fees are rarely collected due to our ability to rapidly re-book our guides but cancellations made less than 72 hours prior to the scheduled trip are very difficult to rebook and generally not refundable. Cancellations outside of 30 days will be charged a $25 processing fee in addition to a 3% fee on deposits collected.